Halloween Horror Nights @ Universal Studios Singapore is coming back for the 3rd time! This year … 3 Sisters of Evil are going to reunite at Halloween Horror Nights 3. The evil Maiden of the Opera haunting in the wings, the Crone of the Forest lurking within the shadows and the Daughter of the Undead prowling amongst tombstones. They are going to unleash their reign of terror over 10 full nights of horror in October and November 2013. Event tickets purchased from 1 August 2013 till 4 September 2013. Limited Time Offer. Return as many times as you dare on 6 off peak nights. 11,12,18,19,31 Oct and 3 Nov 2013. Tickets can be purchase from Universal Studios Singapore ticket booth and online from 1 August 2013. 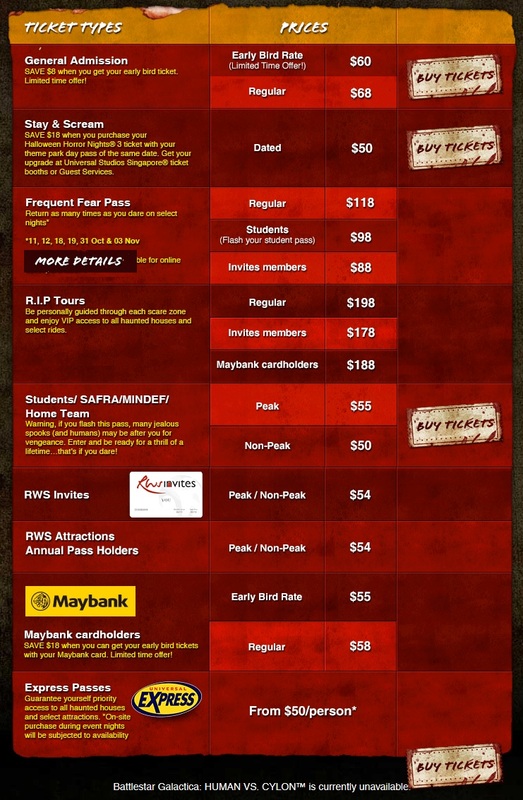 For further information and to buy event tickets, visit HHN3 website. * Halloween Horror Nights 3 may be too intense for young children and is not recommended for children under the age of 13. No costumes or masks are allowed.